Holiday Let Villas and Apartment Rentals in Ikaria, Greece. Stone Villa, sleeps 2, with pool, by the sea. A romantic quality villa for two overlooking the Aegean sea on the island of Ikaria. A quality villa for 4-5 people on Ikaria Island. A charming quality villa for four people on Ikaria Island. 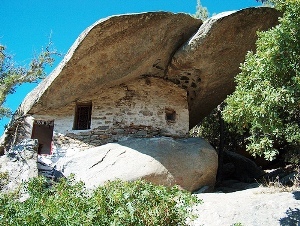 The church of Panagia Theoskepasti is located close to Pighi village and has an interesting roof: a rock. Also, the inside chapel houses the skulls of some monks.